Bloomington, Ind., - Thanks to a cataloging exchange arrangement with the Library of Congress, Indiana University holds 4,000 topographic maps, largely produced by the Soviet military, and captured during World War II. Now a Digitizing Hidden Collections grant from the Council on Library and Information Resources will exponentially increase access and exposure to interested international audiences. 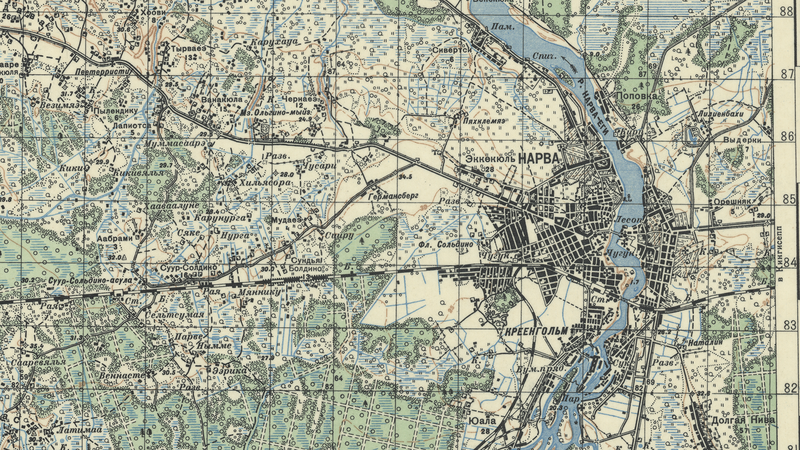 Created by the Russian Military from 1883 to 1947, the maps traveled widely through their tactical use in the field. In the years surrounding World War II, many were captured by opposing forces, including German and American troops. As a result, myriad stamps from institutions they passed through - such as the University of Berlin, the U.S. Army Map Service, and the CIA Map Library - mark the maps with a unique and visual history. “Changes in political boundaries, war, forced resettlement, and demographic shifts permanently changed Eastern Europe,” points out Co-Principal Investigator, Theresa Quill, a social sciences librarian at IU. “These maps provide scholars with a unique historical view of the pre-war landscape,” she said. Specifically, the topographic maps of the Eastern Bloc Borderlands project portray Poland, Ukraine, Belarus, Latvia, Lithuania, Estonia, Finland, and Western Russia – all areas greatly impacted by World War II and of strategic importance to Russia and the Soviet Union. Importantly, digitization of the collection allows international scholars to gain access to detailed historic maps of their region. The highly-competitive grant, administered by the Council on Library and Information Resources and supported by the Mellon Foundation’s Digitizing Hidden Special Collections and Archives awards program, will provide the $62,218 needed to fund the one-year project. The awards program is a national competition that funds the digitization of rare and unique content held by libraries and cultural memory institutions that would otherwise be unavailable to the public. “Our university has a long history of success in leveraging technology to support teaching and research. As early as 1995, IU Libraries began leading digitization initiatives, and we have been fortunate to stay in the forefront of this important work. We are grateful to our partners at CLIR for recognizing the value of the Russian Military Maps collection and for their support to take it to the next step,” said Dalmau. IU Libraries is also known for the breadth and depth of its area studies collections. In particular, the Slavic and East European collection ranks in the top tier of such collections in the U.S., and contains over 700,000 volumes in 15 vernacular languages. More than 1,000 maps have already been digitized and can be viewed at: http://go.iu.edu/1u15. About the grant: Digitizing Hidden Special Collections and Archives: Enabling New Scholarship through Increasing Access to Unique Materials is a national grant competition administered by the Council on Library and Information Resources (CLIR) for digitizing rare and unique content in collecting institutions. The program is generously supported by The Andrew W. Mellon Foundation and is built upon the model of CLIR’s Cataloging Hidden Special Collections and Archives program (2008-2014). Since 2015, Digitizing Hidden Collections has awarded approximately $4 million annually to institutions holding collections of high value for research, teaching, and learning. About IU Libraries: Bloomington, Indiana is home to Indiana University Libraries, one of the nation’s largest public academic research libraries. Our collections, people, and spaces use knowledge to inspire great work. IU Libraries partners with every academic department on campus. Materials are digital, visual, audio and print. Over 60,000 journals are offered electronically, and the libraries hold 9.9 million print volumes in 450 languages, and 100,000 films in its Moving Image Archive. Indiana University’s librarians actively collect and conserve knowledge and are leaders in national conversations on digital preservation and associated technologies, the changing role of area studies librarianship, and integrating information literacy. Our visual flagship, the Herman B Wells Library, is one of the busiest academic spaces on campus, recording 2 million visits each year.